There has recently been dramatic growth in the medium of radio. However, advertisers and agencies too often still use radio for its basic tactical abilities, leaving the emotional power of the medium untapped. This book is a practical guide to understanding and exploiting the true power of radio as the "brand conversation medium". Combining theory, listener understanding and practical advice, the authors explore the scale and effectiveness of radio advertising, how the medium communicates, it's role in emerging brand thinking, and best practice for creating better radio advertising. Overviews, summaries, quotations and checklists are featured throughout, as well as case studies from companies in all sectors including Sainsbury's, British Airways, Carphone Warehouse, BT and the British Government. Mark Barber After graduating from the University of Life, Mark spent 18 years as a media planner in a variety of media agencies before joining the Radio Advertising Bureau in 2001. He has been using radio as an advertising medium since 1983, during which time his perspective has moved from audience cost-per-thousands to the communication benefits of the medium. Mark's previous contributions to radio literature include Understanding Radio, the Brand Conversation Medium and Radio Advertising Effectiveness for Dummies. In his spare time, he supports Charlton Athletic, is teaching himself to speak Turkish, and entertains his children with bad jokes and poorly executed magic tricks. Andrew Ingram Andrew has a broad-based experience in advertising and media. After graduating from Cambridge in 1979, he started commercial life in the advertisement department of the Daily Mail, going on through quantitative research, and qualitative research, and eventually moving into account planning before joining the RAB in 1992. Andrew's previous books include Wireless Wisdom and Understanding Radio. He is a regular speaker at media and advertising conferences across the globe. In his spare time, he indulges in daughters and classic cars, and an art project involving old plastic bags in trees. 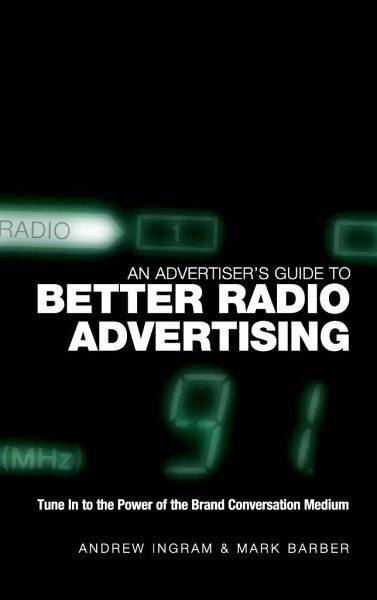 The authors work together at the Radio Advertising Bureau on a daily basis, helping advertisers and agencies overcome the barriers that are preventing them from using radio advertising more effectively. It is this experience that has informed the development of this book.